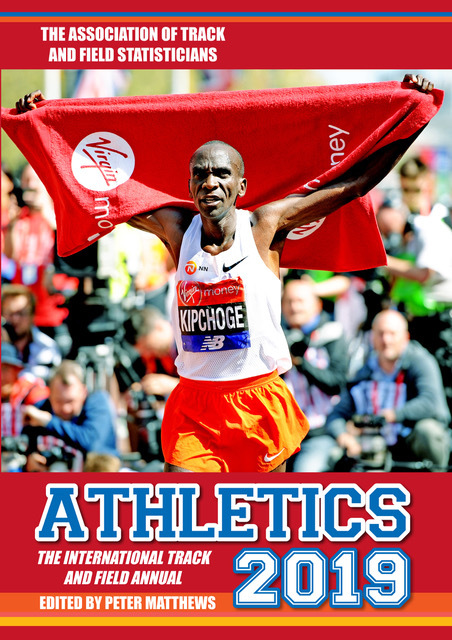 The cover photo of this year’s annual is of Kenyan Eliud Kipchoge, the greatest marathon runner of all-time. In April last year he won the London Marathon for the third time, eclipsing this in Berlin in September when he broke the world record with a time of 2:01:39, taking one minute 18 seconds off the previous best. As usual the annual is packed with essential information for the track and field fan, with results from all major championships as well as a reports of the World Championship and a look forward to the 2018 Commmonwealth Games and European Championships. Peter Matthews has edited the International Athletics Annual from 1984. He has covered most major athletics events over the last 40 years, currently as a television commentator for Sky Sports and the IAAF, having previously contributed to coverage by BBC Radio 1975-85 and ITV 1985-96. He has also announced at major athletics meetings from 1968, including 1970 and 2002 Commonwealth Games, 1994 World Cup, 2003 World Indoor Championships and 2006 European Championships, and worked at seven Olympic Games as commentator or media manager and all outdoor World Championships. A long-time member of the ATFS and Chairman of the NUTS, he has compiled general sports books and is co- publisher with Mel Watman of Athletics International.